"It is an unearthly, strange story." 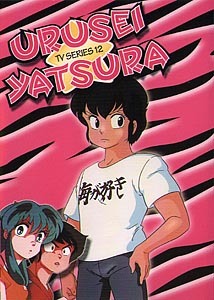 Disc number twelve of Rumiko Takahashi's Urusei Yatsura holds episodes 43 through 46, containing a couple of key installments in the series for which chief director Oshii Mamoru wrote the screenplay, storyboarded and directed. As usual, Ataru and his friends get into all sorts of mischief with the help of his flying wife Lum and a host of alien creatures. The creators continue to find fresh ways to be funny, coming up with clever twists on well-established behaviors, and introducing new oddities. By now, the characters are developed pretty well, but there is always something we haven't yet seen. The cat's out of the bag, and they're not "kitten" around in The Terror of Meow! It's mating season, and the felines are in an uproar, but when Ataru discovers a cute woman who has been transformed into a cat, he takes it upon himself to free her. Cherry comes up with the "purr"fect plan, which means a duel to the finish for Ataru and his rival, especially when the whole "kitten" caboodle gets involved. Are we headed for a "cat"astrophe? Next, has Lum had enough? When her stormtroopers hold a "Lum appreciation party," Ataru's rudeness gets his wife quite upset. When she disappears without a trace, Ataru has to re-evaluate his behavior�but is too late, is she really gone for good? This episode was voted fan favorite after the initial series run, and is one of the few (and I do mean few) where you can really feel sorry for Ataru. There's something fishy going on in the classroom, and it's not just what's cooking on Cherry's hibachi. Benten, Oyuki, and a number of Lum's friends make unexpected visits, but when they see Lum, they take off! What in the world is going on this time? Find out in Lum's Class Reunion. This episode reunites a number of cast members, and also marks the start of another season, which means a new end credit sequence featuring the very disco Cosmic Cycler. The final installment is the battle of bento, in Lunchtime Eat-Out'ers, Gather Around! There's a riot in the streets for the chance to get some eats, as Onsen-mark and the Tomobiki High School staff declare war on students who are eating off campus at lunchtime. Field operations have commenced, and the anti-out-eaters movement has mobilized. Ataru and the gang have to fight for their beef bowl, defying a massive campaign that takes over the entire town. What can be said about this show that hasn't been said already? It's ability to deliver consistently funny episodes time after time is commendable. The character base is both bizarre and diverse, and these episodes bring some added depth in their development. With its episodic nature, it is easy to fit into almost any viewing schedule, and can be watched without worrying too much about show to show continuity. This collection features more memorable Urusei Yatsura goodness, though I'd be hard pressed to nail down any one episode as my personal favorite. Image Transfer Review: Overall the video quality is pretty decent�colors are bright, contrast good, and black levels solid. There is some macroblocking in solid blue areas, bleeding on occasion, and some pretty noticable interlacing in red/blue contrast in last episode. The credits still exhibit ghosting, which in the episodes themselves is pretty muted. Audio Transfer Review: Aside from a bit of hiss, the mono Japanese language track is quite good. Dialogue is clear, although there is occasionally some edginess on loud voices. For some reason the OP on Lum's Highschool Reunion fades in, unlike the other episodes. Extras Review: A couple of AnimEigo's standard recipe-card-sized liner notes are the only extras, containing more cultural trivia relating to each episode. Ryuunosuke makes the cover this time, and gets her bio on the back panel. Even in my foulest moods, I find it nearly impossible to sit through Urusei Yatsura without eliciting a chuckle. The madcap comedy is pretty nonstop here, with another great collection of episodes. The show has a special charm in its writing, with a rich cast of likeable characters that are always a pleasure to visit. At the time of writing this disc is only available in a limited boxed set direct from AnimEigo.